Every day in the studio begins with the breaking of an egg. With this action, I start preparing my egg tempera paint. The egg yolk is the binding agent. Egg tempera is an emulsion paint in which the yolk acts as an emulsifier. 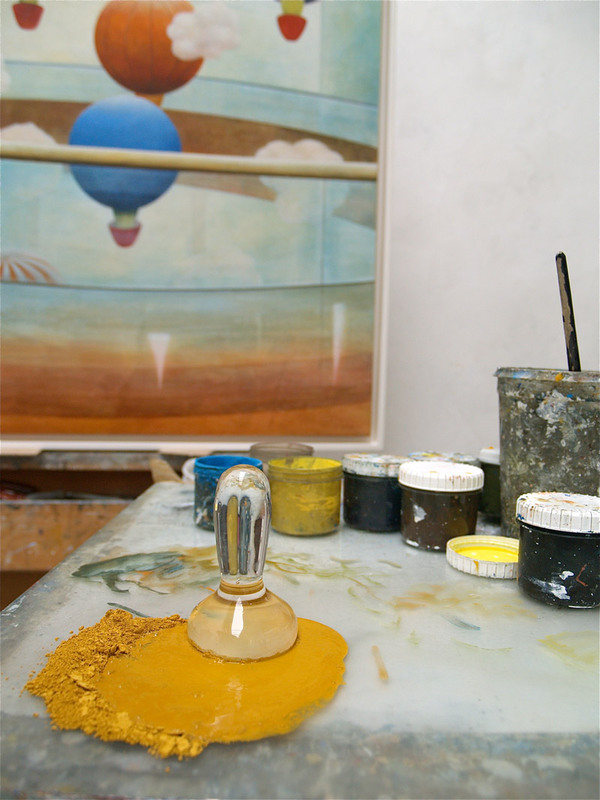 Pure pigments are mixed with egg yolk, which creates a paint that both oil and water can be added to. The yolk connects these elements into a homogeneous liquid. A characteristic of the paint is the combination of a matte, velvet-like surface on one hand, and a crystal clear reproduction of color on the other. The nature of egg tempera is somewhat reminiscent of frescoes. During my studies in 1988, I started to experiment with this technique. I never stopped. The traditional aspects of the painting are dear to me and my work process is closely linked to the content of my paintings. Egg tempera has been used since ancient history and was the most important painting technique until the invention of oil painting. However, the method that I use differs significantly from the meticulous and repetitive style of painting with hatched lines that was usually practiced. After an outline of the composition in charcoal on the canvas, I paint the first basic layers with large brushes. 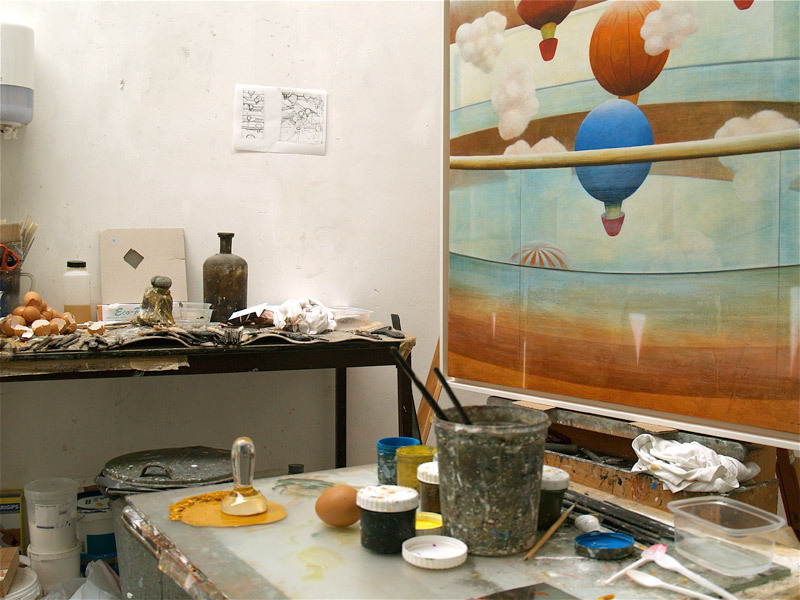 The canvas is usually laid flat on the floor of the studio. Only after these practically abstract undercoats do I start building the figurative structure of the painting. The brush strokes of the first layers continue to play a role in the image formation. I don’t want my paintings to be photo-realistic. The subtle play between illusionism and figuration one hand and the material, painterly aspect, the visible composition and skin of the image on the other hand, is important to me. Before I start the process of painting, there has already been a lot of preliminary work. Photographs that I take during my work travels form the basis for every painting. In small sketches with a fine writer (sort of like note drawings in lines), I combine elements from different photos that I incorporate into a new composition. These sketches determine the design of the painting and my choice for the size of the canvas. The composition is provided in the design, but the final image, the result, announces itself much later in the process of painting. It is exciting to discover for every single painting whether or not it will work. Painting is a process of building and removing, sometimes performing actions that deviate from the original design, it’s always all or nothing. I recognize the final image when it’s there. That moment is euphoric; it always surprises and amazes. You can always make an appointment for a visit to the studio. It is also possible to arrange group visits to the studio, up to 25 people. Contact us by e-mail or phone for more information.